With face oils gaining popularity, there has been a great debate over oils vs. creams. No matter you’re preference, Mad Hippie’s all-natural Face Cream and Antioxidant Facial Oil are full of natural antioxidants and actives essentials that work hand in hand to liberate the skin from signs of aging. 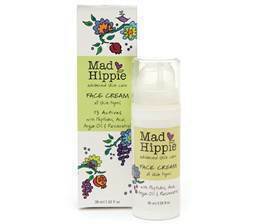 Formulated with 12 actives including peptides, acai, argan oil and resveratrol, the Mad Hippie Face Cream reduces the appearance of wrinkles and creates smooth, healthy skin. The peptides and actives kick-start collagen production while Mother Nature’s best antioxidants neutralize aging free radicals. Formulated with 18 actives including argan oil, goji and camu camu, theMad Hippie Antioxidant Facial Oil is a free radical fighting, ultra-hydrating oil. The active essentials and natural antioxidants work hand in hand to liberate the skin from signs of aging and protect against photoaging. Actives: Argan Oil, Pomegranate Seed Oil, Sunflower Seed Oil, Cranberry Fruit Extract, Pomegranate Extract, Blueberry Extract, Strawberry Fruit Extract, Kiwi Extract, Watermelon Fruit Extract, Grape Seed Extract, Raspberry Extract, Camu Camu Fruit Extract, Acai Fruit Extract, Goji Extract, Sea Buckhorn Berry Extract, Hemp Seed Extract, Broccoli Extract, Vitamin E.
I was sent a sample of the Mad Hippie Antioxidant Facial Oil to review. My skin has been pretty dry because of the change in the weather. I have been using this amazing oil at night after cleansing. I have noticed that my skin has become truly revitalized and feels completely hydrated and supple. Mad Hippie products are available at select Whole Foods stores and online via www.madhippie.com.